This catalogue accompanied an exhibition of the same name at Raven Row in London from February 28 to May 10, 2009. Sainsbury, Alex, Michael Bracewell, and Clive Phillpot. 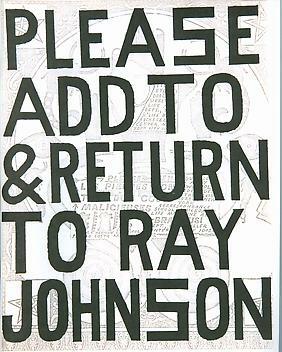 Ray Johnson: Please Add to & Return. Edited by Richard Embray. London: Raven Row, 2009.